All these years you have weaved big dreams of the wedding day. Perhaps now you understand that the first steps towards that dream day starts from announcement. 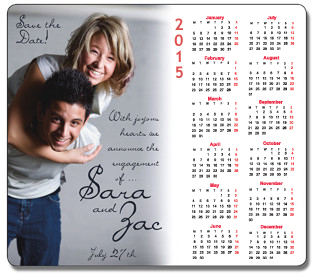 These 3.5x4 custom wedding announcement magnets 20 Mil round corners will allow you to handle that part easily. You can send these personalized announcement magnets as mailers followed by wedding invitations. We know emotions have colors. These personalized magnets will allow you to exhibit your emotions in the colors of your choice because our prices include full color printing. Order today to get started at the earliest! Request a quote to know what you can save on ordering these 3.5x4 personalized wedding announcement magnets 20 Mil round corners.